The best time to have your air conditioning system serviced is before the cooling season begins to be sure the system is working correctly. Your air conditioning system is designed to provide you with many years of comfort, but neglecting regular maintenance can lead to expensive problems and a decline in the performance of your air conditioner. Proper AC service and maintenance is the best way to ensure that your system will continue to function correctly and efficiently. The local air conditioning experts at Precision Air can help you with all of your home's AC service and maintenance needs. We provide everything from regular service to full repairs, and we'll help you keep your home comfortable. Call us today at 1-844-386-0719 or contact us online to get started with a free estimate in Nashville, Franklin, Murfreesboro and nearby! Condensate drain cleaning & clearing: In addition to cooling your interior air, your AC system also removes excess humidity from the air. Water condenses out of the air and needs to drain outside or to an interior drain. Part of regular AC system service should include cleaning the condensate drain and making sure there are no clogs or obstructions that might cause backups. Duct sealing and duct insulation: Has your ductwork system been checked for leaks or undergone leak-sealing improvements? If not, consider having this work done by Precision Air. Leaky ductwork can diminish the performance of forced-air heating or cooling by as much as 40%. If some of your ducts are located in unconditioned spaces like crawl spaces and attics, also consider having these ducts insulated to improve efficiency. If you want to be sure your air conditioning system is running correctly and efficiently, the local experts at Precision Air can help. We'll provide you with a full system inspection and the maintenance services you need to keep your home comfortable and efficient. 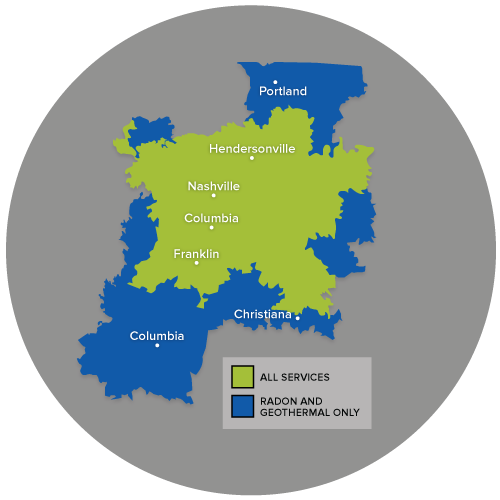 Call us today at 1-844-386-0719 or contact us online to get started with a free estimate in Nashville, Franklin, Murfreesboro, Antioch, Hendersonville, Brentwood, Smyrna, Lascassas, Madison, Hermitage and the nearby areas.